In the majority of situations, individuals pay more attention to their workout ignorant to the fact that exercise is merely a part of the equation in terms of losing weight. According to the principle, 80% of weight loss is stimulated by a healthy diet and the rest comes from performing physical activities. Thus, think about making healthy changes to your eating habits. Keep in mind that your body requires the proper nutrient balance. Carbohydrates, proteins and fats provide us with 100% of our energy. These nutrients are different from each other based on how fast they transform into energy. Carbohydrates are the fastest and fats are the slowest of all. If you decide to stick to a certain eating in order to boost your health and lose weight at the same time, there are a numerous great options such as ketogenic, vegetarian, vegan, Atkins, gluten-free, a lot of other diets. For instance, the ketogenic (or keto) is a low carb diet that can melt the extra pounds without starving you out. Consistency is the most important thing for achieving sustainable weight reduction, muscles/development maintenance, and general health. Don’t forget that you should commit for life to some form of exercise! Furthermore, we present you with an exercise plan we think works best and is the least time-consuming. Day 1 – Begin with 10 minutes. Maintain a slow and consistent tempo. Day 2 – Walk for 12 mins. Maintain a slow and consistent tempo. Day 3 – Walk for 15 mins. Maintain a slow and consistent tempo. Day 4 – Walk for 18 mins. It may be simpler to divide the mins from now on until the week ends. Walk 9 mins in the morning and 9 mins in the evening. Day 5 – Walk for 20 mins. Maintain a slow and consistent tempo. Walk 10 mins in the morning and 10 in the evening. Day 6 – Walk for 22 mins. Maintain a slow and consistent tempo. Walk 11 mins in the morning and 11 in the evening. Day 7 – Walk for 25 mins. Maintain a slow and consistent tempo. Walk 13 mins in the morning and 12 in the evening. Day 8 – Walk 14 mins. 2 mins slow, 10 mins fast, and 2 mins slow cool down. Day 9 – Walk 16 mins with a moderate tempo. Day 10 – Walk 18 mins. 3 mins slow, 12 mins fast, and 3 mins slow. Day 11 – Walk 20 mins with a moderate tempo. Day 12 – Walk 22 mins. 4 mins slow, 14 mins fast, and 4 mins slow. Day 13 – Walk 24 mins with a moderate tempo. Day 14 – Walk 26 mins. 5 mins slow, 16 mins fast, and 5 mins slow. Day 15 – Get up/down the stairs or a path with increasing elevation for 15 mins. Cool down with 2 mins of slow walking at the end. Day 16 – Get 25 mins with a moderate tempo. Day 17 – Get up/down the stairs or a path with increasing elevation for 17 mins. 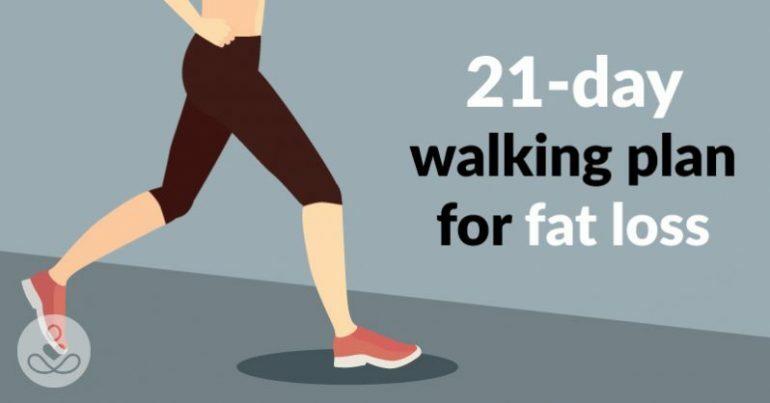 Add 2 mins of fast walk. Day 18 – Get 27 mins with a moderate tempo. Day 19 – Get up/down the stairs or a path with increasing elevation for 17 mins. Cool down with 3 mins of slow walking at the end. Day 20 – Walk 30 mins with a moderate tempo. Day 21 – Fast walk for 25 mins and end with an 8 min slow walk.